Although Reese's Peanut Butter Cups are among the best -- if not the best -- classic chocolate candies, Hershey's somehow managed to make them even better by unleashing a Reese's Piece-filled version last year. Now, the company is taking the chocolatey peanut butter delivery vehicles to the next level again -- this time, by stuffing them pieces of cookies. After rumors of a "#cupspiracy" emerged on social media in recent weeks, Hershey's finally confirmed the existence of its new spin on the classic candy, aptly dubbed the Reese’s Crunchy Cookie Cup. 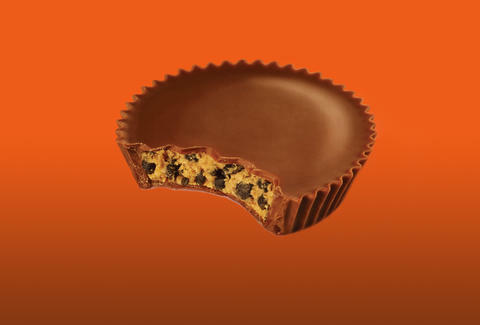 The new peanut butter cups are similar to the Reese's Pieces-loaded version in the sense that it mixed a special ingredient with the peanut butter filling; in this case, crunchy pieces of chocolate cookies. Think cookies and cream, but with peanut butter instead of white chocolate. Yes, please. Hershey's said packages of the Crunchy Cookie Cups will start hitting candy aisles nationwide sometime this May. They'll come in standard two-cup packages as well as two-cup packages of the Big Cup size, according to a press release. May has never seemed so far away. Tony Merevick is Cities News Editor at Thrillist and recently destroyed a bag of Easter-themed Reese's. Send news tips to news@thrillist.com and follow him on Twitter @tonymerevick.